Mobile phones have gone from being a one-to-one conversation device to a fully-fledged communication and collaboration tool with everything you need for the modern mobile work environment. This makes it the perfect communication tool for many professional users. 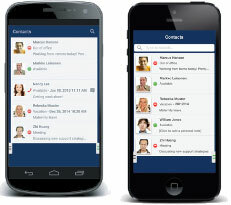 MiCloud for Mobile delivers unified business communication services such as instant messaging, directory search, call transfers, presence, line state and cost control services all on a smartphone. The application can be installed on multiple mobile devices and is supported on iPhone and Android phones and tablets. MiCloud for Mobile enables you to place calls through the Mobile Application either over Wi-Fi or 3G/4G networks using Voice over IP (VoIP).